This traditional styled office chair by Boss Office Products features hand applied brass nail head trim along the front of the chair, a wing back design and plush foam filled seat and back cushions that are tufted with vertical accent stitching. 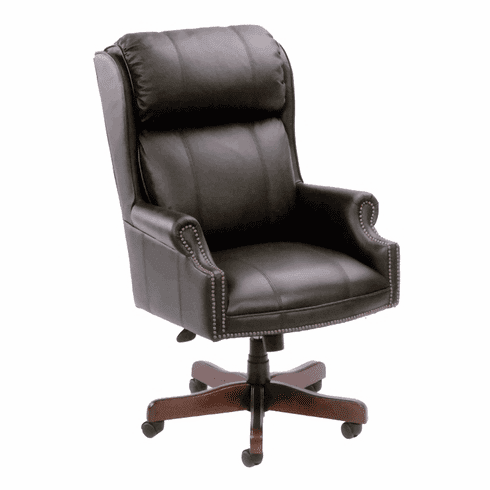 This traditional chair also features a durable 8 way, hand tied, coil construction seat, tilt with tilt tension adjustment, upright locking position, pneumatic seat height adjustment, Upholstered in Boss's exclusive Caressoft Plus that has the look and feel of top grain leather at a fraction of the cost. Rich mahogany finish, wood covered base with dual wheel hooded casters add a warm accent. Warranted by Boss Office Products. Dimensions: Seat Size: 19.25"W x 19"D. Back size: 23.5"W x 28"H. Seat height adjustment: 18"-21"H. This wing back traditional leather office chair normally ships within 2 business days from our GA or CA warehouse. *Ships by tractor trailer due to the size. Customer will need to unload the chair from the tailgate of the truck. Inside delivery is optional.